"It's tragic. … It should never happen in our society but, but, what if 36 years of a record where there’s nothing like that again?" Rep. Kevin Cramer asked. 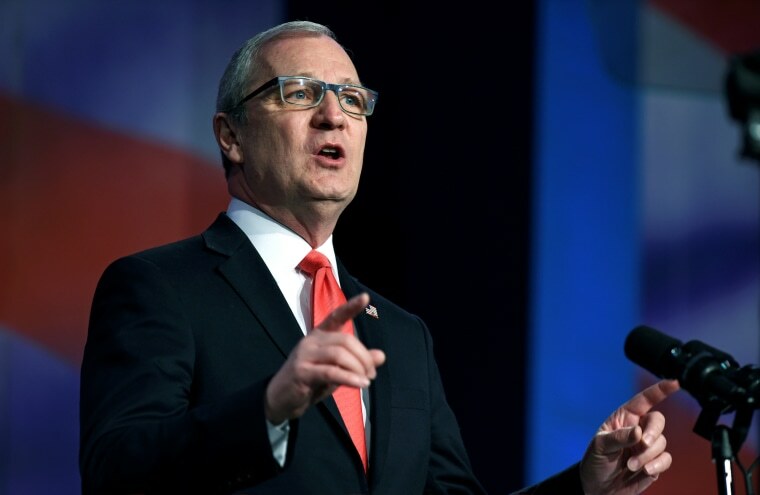 Rep. Kevin Cramer, a North Dakota Republican who is challenging Democratic Sen. Heidi Heitkamp, raised the question Monday night of whether the sexual misconduct allegations against Supreme Court nominee Brett Kavanaugh are disqualifying, "even if it's all true." "Even if it's all true, does it disqualify him? It certainly means that he did something really bad 36 years ago," Cramer said during an interview with Valley News Live on Monday evening, "but does it disqualify him from the Supreme Court?" Moments earlier, Cramer said that he was going to talk about something "dangerous." "What if, what if something like what Dr. Ford describes happened. It's tragic. … It should never happen in our society but, but, what if 36 years of a record where there’s nothing like that again?" Cramer said, referring to Dr. Christine Blasey Ford's allegation that Kavanaugh tried to sexually assault her at a house party in the suburbs of Maryland when they both were in high school. The congressman went on to note Kavanaugh's "record of a perfect gentleman, an intellect, a stellar judge" in the decades since the alleged attack occurred. Cramer also called the allegation from Deborah Ramirez, who told The New Yorker that Kavanaugh pulled down his pants and exposed himself to her while they were both classmates at Yale University, "far more suspicious even than the first one," claiming that Ramirez "is not even really sure what she saw." Kavanaugh has vehemently denied the allegations, telling Fox News on Monday night that "the truth is I’ve never sexually assaulted anyone, in high school or otherwise." Cramer downplayed the veracity of Ford's accusation in a local radio interview last week, calling Ford's claim "even more absurd" than Anita Hill's allegations of sexual harassment against now-Supreme Court Justice Clarence Thomas. "These are teenagers who evidently were drunk, according to her own statement," Cramer told KNOX Radio's Jarrod Thomas. "They were drunk. Nothing evidently happened in it all, even by her own accusation. Again, it was supposedly an attempt or something that never went anywhere." Asked about that statement again Monday evening, Cramer reiterated his view that "nothing happened." The contest between Heitkamp and Cramer is one of 2018's most closely watched, as polls show the two locked in a tight race. Heitkamp's campaign responded on Tuesday, saying that Cramer "displays a stunning lack of empathy for victims and the trauma they experience." "While Heidi is committed to listening to the testimony of both Dr. Ford and Judge Kavanaugh," spokeswoman Julia Krieger said in a statement, "Congressman Cramer has already prejudged."